Stay on Target - Language - for Classroom Management! → Stay on Target (Language) for Classroom Management! Thank you to everyone who hung on tight during a lightning speed chat, and a big thanks to last Thursday’s moderators: Kris (@KrisClimer), Colleen (@CoLeeSensei), Laura (@SraSpanglish), Amy (@alenord), John (@CadenaSensei), and Sara-Elizabeth (@SECottrell)! We’d also like to thank the moderators of Saturday’s Sequel, Laura (@SraSpanglish) and Diego (@DiegoOjeda66)! Question 1: What factors do you consider ‘classroom management’ in the world language classroom? As Langchatters were quick to recognize, ‘classroom management’ can mean much more than discipline. @Marishawkins said, “[Although] classroom management can [be] discipline, I think of it as giving directions.” Other participants shared their own associations. @CoLeeSensei described ‘classroom management’ as a process of starting and stopping activities, effectuating transitions: “[It’s about] getting [students] going on something,’ ‘debriefing.’ ‘stopping them from doing something’ […] (and [everything] in between! ).” @rlgrandis also mentioned transitions: “[Management means facilitating] smooth transitions, making sure students participate, [and] keeping them in [the target language].” Several others noted the value of routines in maintaining management. @learnsafari wrote, “Most of my work is with young children, so ‘rituals and routines’ are the name of the game in classroom management.” Still others mentioned the importance of a sense of safety: “[It means] keeping a safe environment (physically and emotionally)” (@kltharri). Question 2: What issues tend to derail your class’s commitment to stay in the target language? Question 3: What tools and techniques help your class remain on task with high levels of the target language? 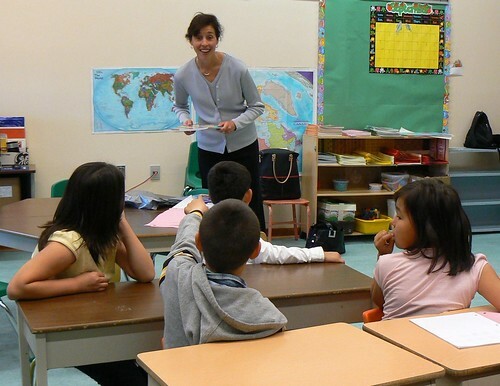 Langchatters suggested three primary tools and techniques to keep students working in the target language: scaffolding, insisting on target language immersion, and teaching students to embrace the unknown. Question 4: What interpersonal task designs keep everyone on task in the target language? When it comes to designing interpersonal tasks that promote target language use, Langchatters recognized the value of modeling, supporting preparation, having students speed date and circulate, and allowing for practice through games. Practice with Games: @SraStilson proposed a game format: “Set it up as a game. Go fish. Pyramid. Guess who. If it’s a game that [requires the target language, students] actually SPEAK [the target language]!” @melyluna415 proposed Taboo as a way to practice circumlocution, and @kballestrini recommended VERBA. Thank you to everyone who contributed to last week’s detailed chat. Now you can get your #langchat on twice a week– Remember, #langchat will take place both on Thursdays at 8 p.m. ET AND then again during the Saturday Sequel at 10 a.m. ET!